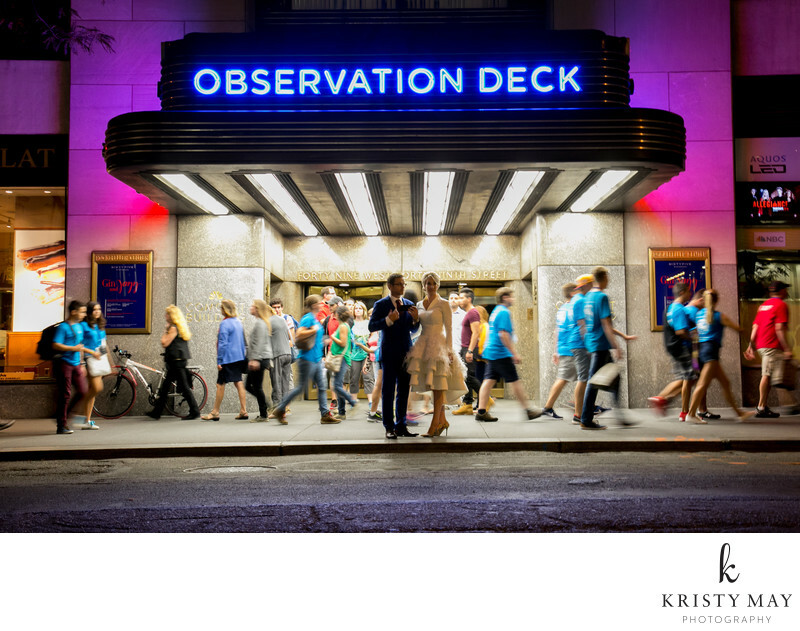 A bride and groom wait for a taxi under the neon awning of the Top of the Rock Observation Deck marquee. The Top of Rockefeller Center offers amazing views of Manhattan and is a wonderful place to take your New York wedding, engagement or elopement portraits. There are 3 levels each offering a different experience and perspective on New York City highlights like Central Park and the Empire State Building. The staff has been super helpful with my wedding couples so I can highly recommend a stop at Top of the Rock if you are looking for a location with sweeping views of the city to add to your portrait session. Location: 30 Rockefeller Plaza, New York, NY 10112.